Google recently discontinued the free basic Google Apps for Business offer. Existing customer can keep their accounts but new users are, at least officially, not allowed to have a free account. However, you can continue to use your existing account you already have. Not sure if it’s intentional or an oversight, but there still exists couple of ways for users to get Google Apps for free without going for the new paid Individual Account option. 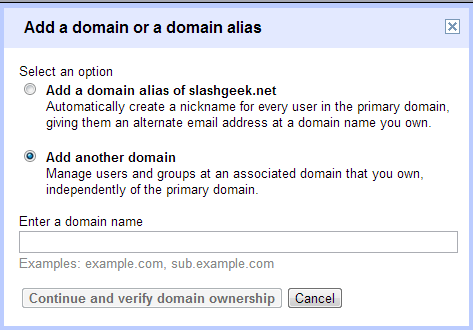 For existing Google Apps users, you can go to your Dashboard > Domain Settings > Domain names and add another domain that is independent of the primary free domain you have. Sign into your Google App Engine (appengine.google.com) with your Google account. Create a new application, you will verify your account using a phone number by text or voice call. Fill out the necessary info to create your new application. After Application registration goes to Dashboard > Application Settings > Add Domain and it will provide you with a link to sign up for a free Google Apps account. I don’t understand why Google made it so easy to get free Google Apps account but the same time “officially” discontinued it. It could be an oversight, but whatever it is you might wanna take advantage of it before Google decides to close the loophole.